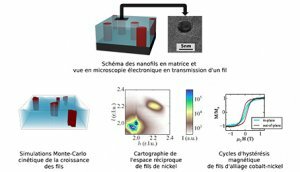 In this PhD thesis, we study the growth and the properties of ferromagnetic nanowires made of cobalt, nickel and cobalt-nickel, embedded in a matrix made of of strontium and baryum titanate. The nanowires are grown taking advantage of self-assembly processes occurring during sequential pulsed laser deposition. First, we model the growth with a kinetic Monte-Carlo code to highlight the parameters that control the diameter and the density of the nanowires. Then, it is shown that the nanowires are strained along their axis, and relaxed perpendicular to it. The origin of the strained state is explained in the framework of the Frenkel-Kontorova model, and its inhomogeneities are described through analysis of mappings of the reciprocal space. Furthermore, it is shown that the strain is high enough to shift the magnetic easy axis of the nickel nanowires, through magneto-elastic coupling. Finally, for Co0.4Ni0.6 nanowires with a diameter greater than four nanometers, the blocking temperature of the assembly is above room temperature and the energy barrier for the magnetic reversal of the nanowires is of the order of one electronvolt. This is interesting for potential applications in data storage, for example.